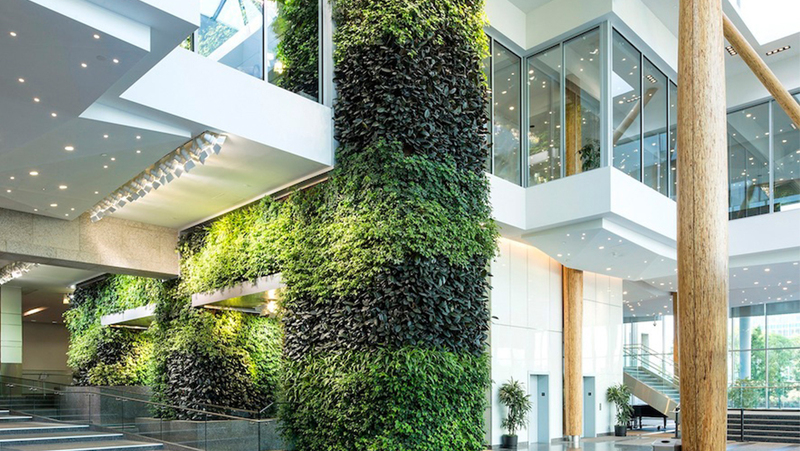 Green walls are becoming more popular in both villas and offices. Their attention-grabbing allure and eco-friendly appeal create an exceptional design accent for businesses and homes alike. Not to mention, green walls full of lush plants create a warm and inviting environment for both staff and clients. Here’s everything you need to know about green walls. We’ve also included a few design ideas to provide a little inspiration for your space! 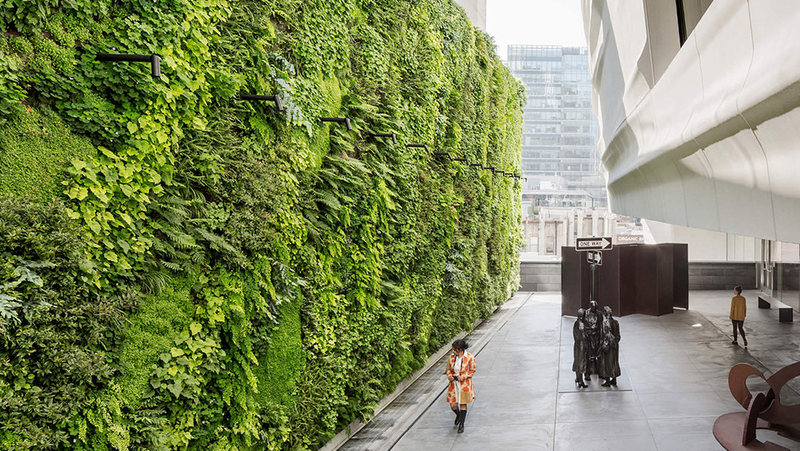 Green walls are exactly what they sound like. They are walls covered with green plants and flowers. Also called living walls or vertical gardens, green walls include all the materials needed to help your plants thrive, including soil, custom lighting and an irrigation system. You can design your living wall for both indoor and outdoor spaces. Living walls create a stunning, eco-friendly work of art to enhance any area with plant life. Additionally, living walls have many other added benefits. From green walls to interior gardens, the benefits of working and living in a space surrounded by plant life are vast. In fact, in a study completed by the New University of Technology Sydney, plants were added to offices for a three-month period. The research showed employees with plants in their workspace experienced a 30-60% reduction in stress levels. Not only do green walls reduce stress and increase happiness, but they also can improve a person’s overall health and wellness. 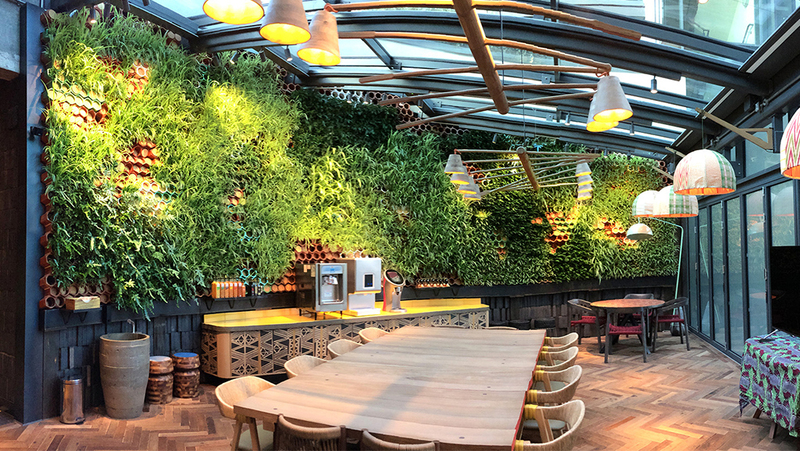 Restaurants, hotels, and offices that include living walls enjoy a wide range of benefits. Green walls create a warm and calm space for staff and clients. Furthermore, adding plant life to indoor spaces improves visual appeal. Living walls create a lovely, eco-friendly accent guaranteed to leave a lasting impression. Plants improve air quality. In fact, the presence of plants improves air quality by filtering toxins and removing harmful particles from the air. Living walls create a natural noise barrier. Plants are proven to increase health and wellness. In fact, green plants and flowers make people healthier, more productive, and happier. Green walls can also include custom water features. 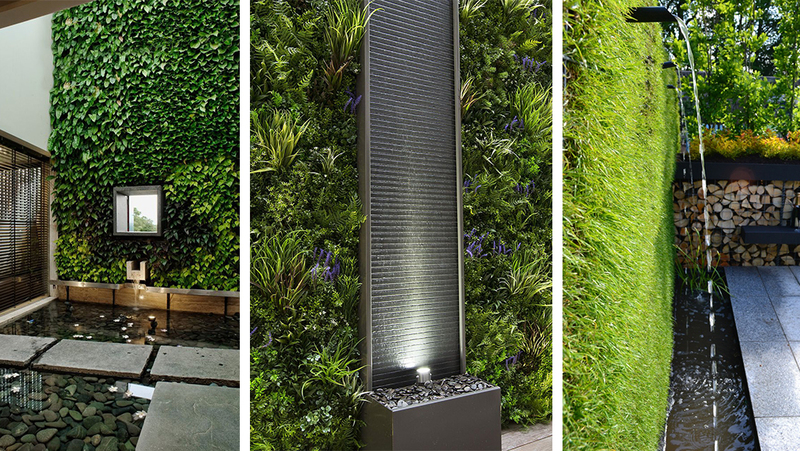 Living walls are the perfect place to create a focal point with a soothing fountain or custom water feature. Green walls with waterfalls and water features have the double benefit of injecting the soothing sights and sounds of water in your space. 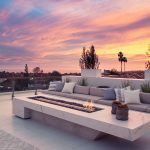 In fact, living walls coupled with water walls add to the unique visual appeal of bringing elements of the outdoors into your interior design. At Milestone Gardens and Interiors, our design team plans and builds custom living walls for interior and exteriors. Whether you desire a traditional green wall, wish to create a living wall in a unique space or want to get creative with wrap around corners, the options for adding plant life to your space are endless. Contact a member of our team to schedule your free design consultation.